Real BBQ takes time and love. Sadly, until just a few years ago, the options in Edmonton for BBQ were really poor. Now BBQ places are popping up everywhere. I even see a BBQ food truck around town now. Thankfully, real deal BBQ isn’t that tough to experiment with. Sure you might not win an award or have the quote/unquote best-ribs-in-town, but I bet that if you even gave it a try you’d be happy and full. I stopped by ACME to see Corey as I’d requested a hunk of brisket to smoke this weekend. The 8lb brisket was perfect and would offer more than enough meat. Once home, the meat was seasoned with a basic rub(see below) and wrapped in saran for the night. An hour and half before putting the brisket into the smoke, it was out of the fridge to come up to temperature. The hickory, with a bit of cherry, was burning nicely at 215-225 degrees. The brisket went in fat side down and after a bit of temperature stabilizing, settled in nicely for the ride. After four hours, the meat was flipped and given a bit of sauce mop. As we went through the seventh hour, the meat was 175-180 degrees. 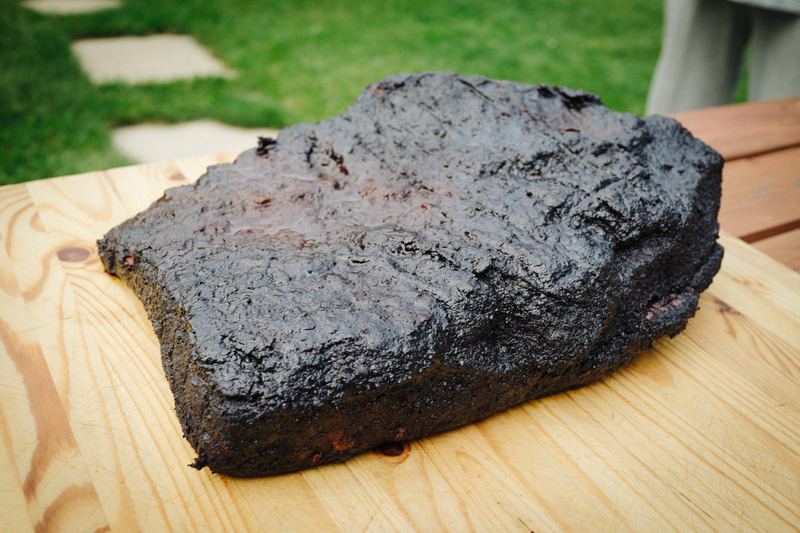 This is the perfect time to remove and let the brisket rest in peace. The meat was wrapped in foil and then inside two big towels for just over two hours. That’s right, over 9 hours of work for this one piece of meat. What did I tell you. There is love inside! The bark came out nicely and the meat was done perfectly for slicing and building brisket sandwiches. If the meat was pulled from the heat another 10-15 degrees higher (and still rested), it would be in the pulled-beef territory. So in the end, it’s all about how you want to consume it. There is no right or wrong with this piece of meat and there is a big window of deliciousness. Give it a try…or just come by for a sandwich on me.